Last weekend turned out to be a wonderful weekend to spend outside in the Adirondacks. The Fall foliage was still breath taking and the days were clear, warm and sunny. I started my weekend with a great hike up Cascade Mountain, one of New York State's 46ers. That is, it is one of the mountains in NY over 4,600 feet in elevation. The Cascade hike is another classic Adirondack hike I've done many times. The trail head is right down the road from my home in Lake Placid, so it is an easy afternoon's endeavor to get to the top and back down by supper time. 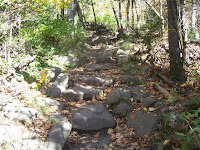 The trail to the summit is about 2.5 miles and has a number of helpful stone stairs for the steep sections. It was a day for the record books as these photos will attest. The weather was beautiful and the trail was not yet crowded since it was Friday afternoon. The past holiday weekend turned out to be one of the busiest hiking weekends in a long time. I wondered, in this economy, why is tourism at an all time high in the Adirondacks these days? To some degree, I think people flock to the Adirondacks because nature is an anchor when most everything else cannot be relied upon. Obviously, the unstable economy is extremely distracting and can cause significant worry. As usual, there many things to worry about in our world. Like all things, the worst part of the worry is fear of the unknown and not knowing what is going to happen next. But, as usual, the sun will come up tomorrow and the leaves change and will eventually fall off the trees. And it will get cold and snow soon. I know without doubt these things will happen. Maybe that is why some of us find comfort spending time in, and surrounded by nature. Maybe the sublime attraction to the wilderness experience has a great deal to do with the feeling that at least we know what to expect.